Making Ireland Modern was a touring exhibition that formed a key strand of ART: 2016: The Arts Council’s programme as part of Ireland 2016. The mobile pavilion presented ten infrastructural episodes spanning a period from 1916-2016 and explored the relationship between architecture, infrastructure and technology in the building of a new nation. Originally constructed as the Irish Pavilion for Venice 2014 in response to the theme of Absorbing Modernity, the design challenge was describe and express modernity in Ireland. The intent was to reflect the theme through the structure, curation and design of the exhibition, from construction and display through to signage and ephemera. The pavilion was conceived as an embodied and diffused manifesto that seeks to reconnect with a lost tradition of modernism in Ireland. 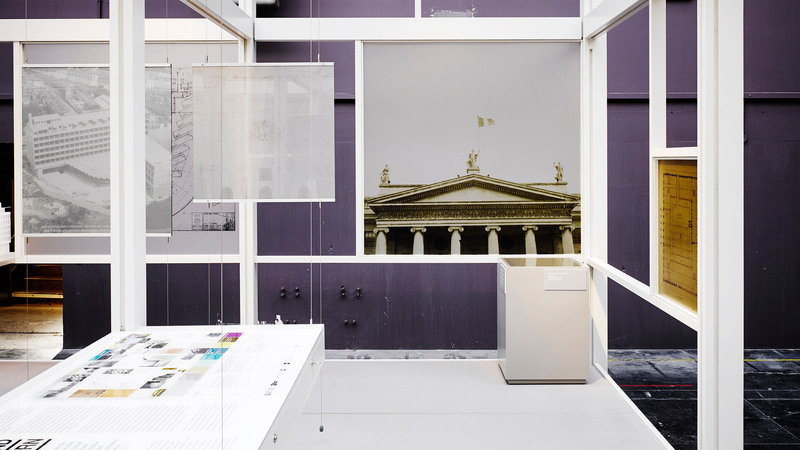 Making Ireland Modern was a mobile pavilion originally constructed as the Irish Pavilion for Venice 2014, which was expanded and reconfigured as a touring exhibition in Ireland for ART: 2016. Constructed as an open matrix of drawings, photographs, models and other artefacts, the pavilion consisted of a timber structural frame lit by daylight. 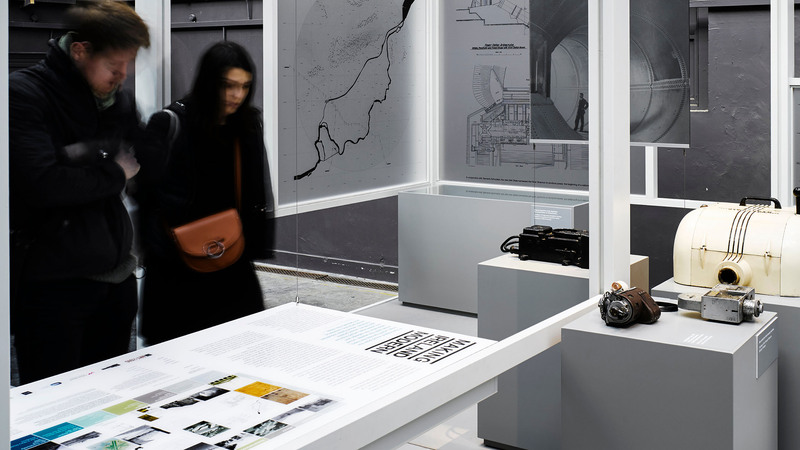 The pavilion presented ten infrastructural episodes spanning a period from 1916-2016 and explored the relationship between architecture, infrastructure and technology in the building of a new nation. In plan, it was divided into square bays. The square module was used again in section to realise a series of cubic volumes. This simple organising system was sub-divided into smaller modules which articulated the hanging of the models, drawings and photographs, as well as the flow of visitors. Both the pavilion and its construction reflected the contents of the exhibition. The flexible, indeterminate and extendable potential of the frame is realised within many of the buildings exhibited. In the pavilion it allowed the visitor to view the sequencing of bays simultaneously, while the structural system facilitated repeated re-assembly and reconfiguring as the exhibition toured. This modular approach was also reflected in the design of the identity and print ephemera for the exhibition. 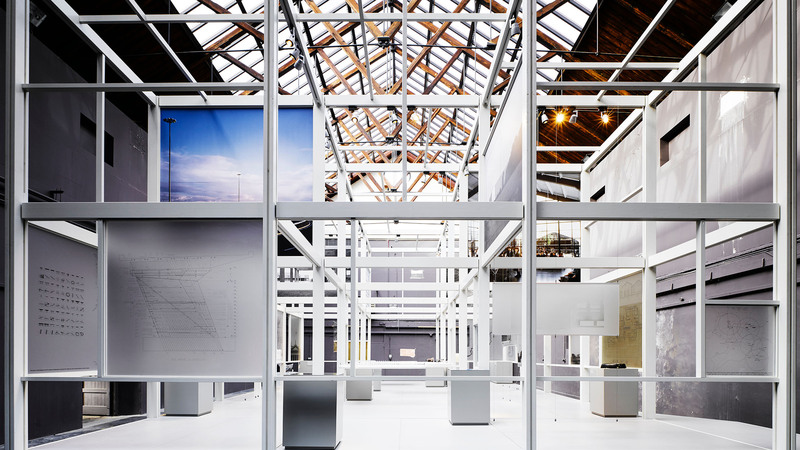 The pavilion and exhibition design expressed themes of modularity, prefabrication, prototype, system, and lightness that reflected the intent of the buildings that featured within. Placing architecture within a technological and cultural flow of national and international dimensions, it manifests the operations of infrastructure in the making of Irish modernity at a range of scales from the detail design of objects to entire landscapes and other social and physical territories. Between July and November 2016 Making Ireland Modern toured to three venues across Ireland in Galway, Cork and Dublin. The pavilion was adapted for each of the diverse venues, as well as public programme and specific events for each location. The exhibition displayed and communicated the architecture of the ten infrastructures, as well as popular ephemera associated with each. The social history and the architectural innovation, and to communicate with a broad audience through a touring exhibition.